I started this skirt about a year and a half ago. One yarn is a dark blue boucle yarn from a cone that I bought from a person in Atlanta who was reducing her stash about 10 years ago. 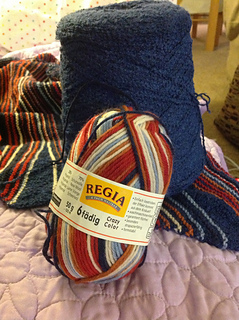 The second yarn is a multicolor Regia sock yarn in a colorway that I love, see photo. It’s a little bold, but I like bright colors. This is the first skirt I’ve ever attempted, given skirts’ propensity to sag in the behind. 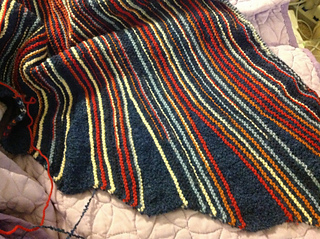 The combination of the two yarns in this pattern, plus the bias in the pattern, may make this one not sag too much. We’ll see! 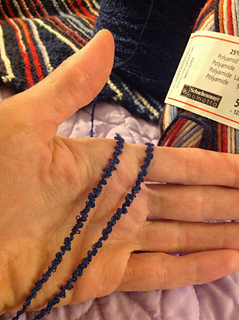 The boucle yarn has sat in my closet for years because I wasn’t sure what to do with it. I think it would also make a beautiful shawl. 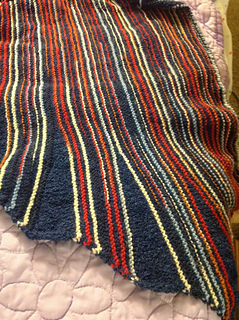 I made a swatch of a shawl from the Knitter’s magazine lace book (from about 1999) and it had a lovely drape. But, it never got onto my needles. If there is enough yarn left, I might try to knit a light jacket or sweater to go with the skirt, using the blue boucle as the main color and the sock yarn for accents, like a border, or pocket edging or something. Update: skirt is almost done! Have Kitchener stitched it together and it fits! Now, have to pick up sts on the top and sew in an elastic band. Have never done that before.